This item (P6890) is not currently available for purchase. White LED lightshow tree delights onlookers with 9 stunning animation sequences that automatically loop. 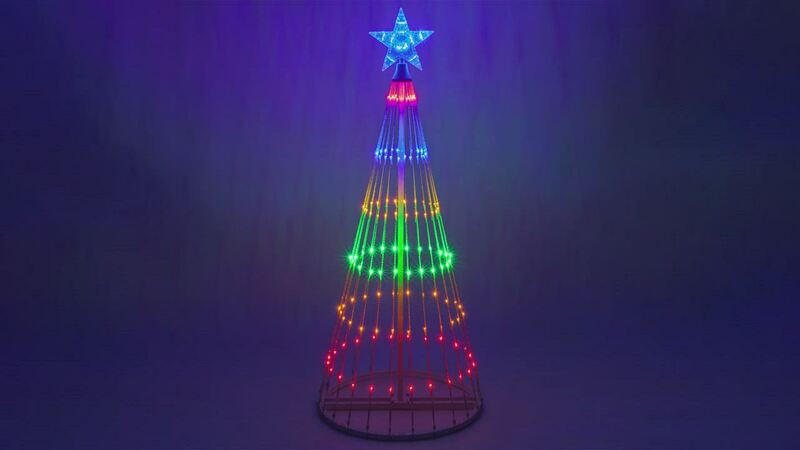 Create an amazing lighted Christmas spectacular this year with a light show outdoor Christmas tree decoration with star topper! Your sales and customer service departments are superb. We reported our problems to Margot and Manager Peter Brenner and they handled our concerns to our complete satisfaction.You advertised this tree as a multi-function nine light display. It is not. It is a single function (on or off), horrible strobe like, very bright flashing light display. Most condominium and home owner associations prohibit flashing light displays.It's too bad you truly did not have a 9 function control, such as power off, power on, steady on, flash, blinker, rotator, adjustable timer, etc. We certainly would use your company again and would recommend you to our friends. I ordered this after Christmas and once we got it we set it up to see how it looked and kept it up fir a couple days because it was so pretty. The many different light patterns are wonderful to watch. The shipping was done in s very timely manner and updates about my order and the status of it were sent out faithfully. Thank you for great customer service and a beautiful addition to our outdoor decor. God Bless.